On Wednesday 29 Club Members travelled to Saddlebrooke Ranch (SR) for the first annual SR and Quail Creek Invitational Tournament. A big thanks to Garry Grasso from SR for organizing. Next year it will be held here (get ready). It was a round robin format for women’s, men’s and mixed doubles skill levels 2.5, 3.0 and 3.5. Women’s and men’s in the morning and mixed in the afternoon. Each team played the equivalent of 6 games. The Club winner was determined by number of matches won versus opponents from the other community. We were down after the morning play, but came back strong in the afternoon to wrap up the win with a score of 32 to 31. We’ll find a place to show off the trophy that will stay here until we defend it next year. Congratulations to all who played. It was a very hot day and those who participated in both the morning and afternoon round robins played the equivalent of 12, competitive games. 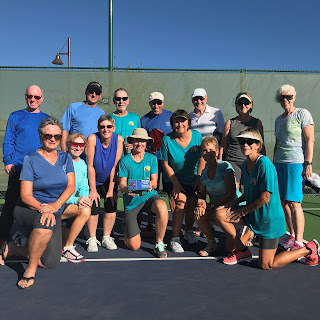 Way to go Quail Creek Pickleball Club!! All drill clinics on Tuesday October 31 are canceled. We'll let you know when they will continue again. Nationally recognized Picklball Instructor Mark Renneson will be at Quail Creek November 13, 14 and 15. Mark, from Third Shot Sports, is widely acclaimed as one of the top pickleball instructors in North America. Mark visited Quail Creek last fall and reviews on his clinics and private lessons were very overwhemingly excellent. We are very fortunate to be able to offer access to an instructor of this quality. Ask any Club or outside instructor and they will encourage you to take as many clinics from top professionals as you can. Mark will be able to provide you with playing skills and tips that we cannot. Clinics will be open to both Quail Creek and Green Valley pickleball club members. If sessions fill, we will work with Mark to expand offerings. Private lessons will be held a Quail Creek on Monday afternoon and Wednesday morning. Learn more about Mark Renneson here. The QCPC is happy to announce expanded offerings and a Club Schedule. We’ve received requests from many asking for more opportunities to play with people of similar skill level and improve their game. People also enjoy our Wednesday Round Robin Social, drill sessions and assisted play. Our goal is to offer our most popular activities weekly or, in some cases, monthly. One of the roles of clubs across the nation is to develop schedules for court use for all skill levels. We have looked at web sites and schedules from about a dozen different clubs to develop what we think will work for our us. This schedule is a work in progress, meaning that we monitor what works, what needs tweaking and what is used or not used. Our club membership expanded by over 50 people in the past few months. It is very exciting to see so many new faces. More members also mean more people trying to use the courts during Open Play. We want to use the schedule to help spread out use over more hours of the day, especially now that the weather is cooling off. “Prime time” is considered to be optimal times for outdoor play. For us it is always in the morning, either very early or midmorning to noon. It is a goal to always keep some courts available for resident drop-in play during Prime Time. The weekly Club schedule is available on our web site (www.qcpickleball.org) and there will be a calendar posted on each court for that week’s use. This first schedule includes Open Play, 2.5, 3.0 and 3.5 Skill Level Play, Challenge Courts and Skill Level Drill Session. We also will add Assisted Play as soon as we have volunteers to help organize and run these sessions. These activities are for Club Members ONLY. A BIG question often asked is “how do I know my skill level?” We ask that you self-rate or play in tournaments to get a USAPA rating. Our club currently does not have the proper resources to form a ratings committee. To determine your rating, look for ratings under Pickleball Resources on our club (www.qcpickleball.org) website or download descriptions directly here. Then determine the level that best describes your skills in game situations. As you advance in skill levels you must have all the skills listed and use them in games, especially against higher level players. If you are losing a lot and by a lot, you are not in the correct skill level. Open Play – Courts are reserved for drop-in Member’s Only Play. Skill Level Play – Courts will be designated for specific skill levels 2.5, 3.0 and 3.5. Men and women of the same skill level are encouraged to attend these sessions. You can come any time during the hours posted, if you are this skill level. Challenge Courts – A couple of courts will be designated as Challenge Courts. Challenge Courts are a good way to get to play against better players. Rules are that the winning team stays on for 2 games. If you want to challenge the winner, a double’s pair places their paddles either on the fence or on the ground in front of the court. This is the signal that you are challenging in. If your team was the winning team and on the court for 2 games, you need only sit out 1 game to challenge back in. Skill Level Drill Sessions – Instructors will organize drills that are appropriate for the skill level. It is important that you attend drills in the correct skill level to make it a beneficial experience for the other participants. Some sessions have a capacity limit and currently are on a first come first serve basis. Session times depend on availability of the instructors and may vary week to week. If a drill session involves a sign-up and there is no sign-up link that week, the session will not occur. Skill Level Assisted Play – More advanced players will work with players in game situations to help with shot selection and strategy. For example, a member can request a 2.5 mixed round robin using 3 courts on Saturday from 2 to 4 pm. To support these requests, the club will reserve courts and provide Round Robin materials for the Organizer. One of the reasons we want these requests to go through the Club is to help us manage court use. It is a concern that we already have days when all our courts are full during prime time and we don’t have all our snowbirds back. We want to minimize wait times for Club Members during Prime Time. We also have a goal of keeping 2 to 4 courts open for reservations. Requests for more than 3 courts will be considered, however we will not be able to accommodate these groups during Prime Time. Please bear with us as we go through growing pains with our new schedule and offerings. And please thank Karen Morse for her energy and leadership as Committee Chairperson of our new Player Development and Organized Play Committee. The committee will be evaluating how things are going with the schedule and seeking feedback. GVR to invites QCPC members to their Fall Round Robin Tournament on Oct. 30, 31 and Nov. 1. They are using the Shootout format (no partners needed) and are having a good sign up. So far the 3.5 mixed is the only full division and there are lots of openings in the 2.5 and 3.0 groups. This is a link to their SignUpGenius page for the tournament, http://www.signupgenius.com/go/20f0d4aa8a728a2f85-fall4 . There will be no Round Robin on Wednesday, November 1 because of the Halloween Social. Find out about the social below and sign up before noon on October 31st. Please join us for an evening of Halloween pickleball fun- round robin, food, door prizes and great company. Bring a chair and the beverage of your choice. PICKLEBALL: Round Robin Tournament will be played from 4-5 PM, so please indicate on sign-up if you want to play or just attend the social. In keeping with the festivities of Halloween, you are encouraged to dress in costume that will safely allow you to play pickleball. But costumes are optional. There will be door prizes at the end of the evening. Sign-up here to attend, play, bring food, or help. You may sign up multiple people with one sign-up, but be sure to indicate how many you are signing up for each thing in the Quantity field and put the other person's name in the Other Person field.